Water is essential to life, for we cannot exist without it. We are running short of fresh, clean water in many parts of the USA. That is also the case in many other countries. Those who live in the northeastern quadrant of the lower 48 states are generally in good shape for now, water-wise, though there may be local issues with clean water in places. But as you travel west of the Mississippi, average annual rainfall drops off sharply, particularly in the desert southwest, which includes portions of the Chihuahua, Sonora, and Mohave Deserts. The situation is particularly foreboding in the Colorado River Basin. There are more demands for the water than the river can reliably supply. Las Vegas is vulnerable to a water emergency, as are Phoenix and Tucson. Thirsty Los Angeles gets drinking water from far away Northern California via the California Aqueduct. As the podcast from a few weeks ago highlighted, water management and access is becoming an ever-increasing concern for many parts of the country. 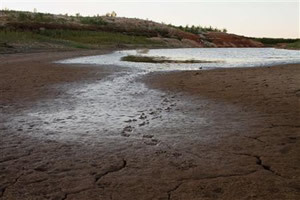 Here in Texas, where I live on a ranch, we have been hard-hit by an exceptional drought. Meteorologists forecast a continuation of this drought through next summer – and believe me, last summer was absolutely brutal. Those of us with livestock got hammered, with hay selling for $120 per round bale in my area. Rural water districts imposed severe restrictions, and in some cases outdoor watering was banned entirely. Pastures turned to dirt from lack of rain. Subsurface moisture disappeared. Crops withered. Most CM readers probably live in urban or suburban areas and may not be so interested in the difficulties faced by agricultural producers in Texas. But you will be affected in due course, when the price of beef rises as producers eventually begin to rebuild their herds. Texas farmers and ranchers have sold off much of their livestock because they cannot afford to feed the animals. But enough of this tale of woe; let’s concentrate on constructive things we can all do to ensure a supply of safe water for drinking, cooking, and household use (washing; flushing the toilet; watering that veggie garden). It matters little where you live, for it does not take much imagination to think of circumstances where things could go wrong with the water supply that most people take for granted. If you have taken the steps in the WSID Guide to ensure that you have a short-term emergency supply of water and a filtration method, you have your first base covered. Now it's time to look at long-term water access to cover your bases for extended droughts and water emergencies that you may have to live through. What will you do if a day comes when you turn the tap on and nothing comes out? You finally get through to the water utility and learn that the outage might last for days. If you make a few preparations now at modest cost, you can deal with that at minimal inconvenience should it happen. Let’s take this a step further: Suppose the population in your locality overwhelms the ability of the water utilities to meet the demand. It could happen. Planners try to think many years into the future and attempt to ensure an ample supply of potable water. But things can go wrong. For example, we are living in an era of budget austerity, and that might endure for some time. It costs fabulous sums of money to create a large-scale water delivery system – and funding is short. Some municipal water utilities rely solely on electric pumps to deliver water through a series of pipes to the end users. Suppose the electrical power fails for an extended period. Think it can’t happen? Ever heard of Murphy’s Law? Well, Murphy was an incorrigible optimist. Of course, we all hope for the best, for that is human nature. It is wise, however, to prepare for less favorable outcomes. The good news is that (a) it’s possible, (b) it’s not difficult, and (c) it can be inexpensive. 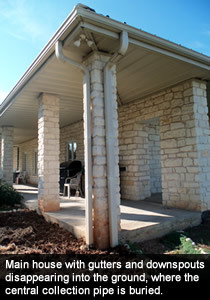 While rainwater harvesting systems can be quite inexpensive (e.g., a barrel under a downspout), they can be as complex and sophisticated as you please. The sky is the limit. You can overspend an unlimited budget if you are so inclined. From long experience, I would discourage needless complexity. The old “KISS” rule is best – Keep It Simple, Stupid. There is much wisdom and economy in that old saying. 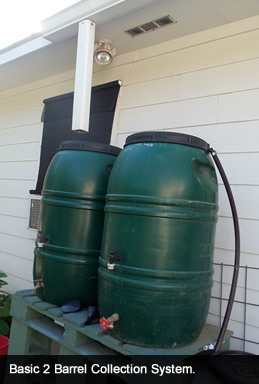 In its most basic form, rainwater harvesting consists of a collection component (a rooftop, plastic sheeting on a hillside, or any other non-permeable surface with enough area to collect rainfall when it occurs), a channeling component (gutters and downspout, hoses, or piping), debris filtering method (to keep leaves and sediment to a minimum), and storage system (above-ground barrels or water tanks, cisterns, etc). Let’s say that you are growing a vegetable garden and have some flowerbeds that you lovingly tend. Plants love rainwater. They do much better on rainwater than on treated city water. Have you noticed how plants perk up following a rainstorm? They don’t react the same way to being watered using a garden hose. As long as you don’t plan to drink the water, it does not much matter what kind of roof you have. Take a look at your home site. If it is level ground, then you are somewhat limited in how much rainwater you can collect, unless you put in a cistern of some kind below grade level. Most people would not want large rainwater tanks under each downspout, though small ones can be hidden behind shrubbery. Cisterns come in several forms, such as concrete or ferrocement. On a level lot, a problem with cisterns is that you have to hire a backhoe or excavator to dig a hole, and that’s expensive. Then, because the cistern is below grade level, you have to use an electric pump to run your irrigation system. That starts to violate the KISS rule. If you have a sloping lot, lucky you! The rainwater collection tank can be placed at the low end of the lot and gravity flow will fill it when it rains. You’ll need some sort of rough filter (e.g., a simple screen) to keep leaves and twigs from getting into your collection tank. You’ll still need to pump the water back up when you use it on your flowerbeds or garden, though. Hello, electricity. We are so dependent on electricity – no getting away from it for most of us. That’s a whole other topic and beyond the scope of this article, along with Peak Oil and a lot of other nasty peaks that are peeking over the horizon. That brings us to potable rainwater harvesting systems. Out the window goes the KISS system; for now we’re talking complexity. First you need an appropriate roof. Metal is best. Again, you need a collection system, which means gutters, downspouts, one or more collector pipes, a rough filter, and a storage tank. The rough filter is sometimes known as a “roof washer” and it can be as simple as a bit of screen wire mounted to a metal frame that the water in the collection pipe must flow through before it goes into the storage tank (there are also other ways of doing this). The screen keeps twigs, leaves, and other debris from getting into the tank. You’ll need to clean the screen after every rain. As soon as you collect the rainwater, it starts to accumulate bacteria. You can deal with this in a couple of ways. One way is to add chlorine (bleach or tablets), which takes care of the bacteria. But chlorine dissipates fairly quickly, so you will have to do this on a regular schedule. Be careful – chlorine is a deadly poison, so determine how much you need to add and be as precise as possible. Before you consume the water, you must make it potable, which means running it through some sort of filtration system and then pumping it into your house for everyday use. I can honestly state that I’m an expert on fully potable, entire-household rainwater harvesting systems, because I acquired my expertise the hard way – through trial and error and by making just about every conceivable permutation and combination of mistakes along the way. A bit of history to put things in perspective: when my wife and I bought this property about 17 years ago, it was raw land, so we had the opportunity to build our dream home. Ours was a simple dream of country living – nothing fancy, but comfortable, with plenty of elbow room (good fences make good neighbors, and all). A talented friend designed the house for us. It’s on a steeply sloping lot on top of a hill – ideal for a rainwater harvesting system. I researched everything carefully and we designed it as state-of-the-art for the time. The house has a heavy gauge metal roof with gutters and downspouts flowing the water into an underground central collection pipe. The water flows downhill through a German-engineered centrifugal filter that removes debris, before flowing into a 16,000 gallon fiberglass storage tank. The original system included a chlorinator pump that kept the water moving slowly in the big tank and added chlorine constantly, but that proved to be a nuisance and a maintenance headache. Later we removed the chlorinator when we upgraded the system. From the main collection tank, a stainless-steel pump sends the water uphill to a heavily insulated metal building with a 3,000 gallon fiberglass tank and a truly Byzantine array of pumps, valves, pipes, pressure tanks, filters, microprocessors, etc. The water is pumped into the 3,000 gallon tank. From there it goes through a sand/multimedia filter, a carbon filter, a five micron filter, a one micron filter and finally through a sophisticated Aquacore computer controlled filtration device before being pumped into the house. A series of pressure tanks maintains constant water pressure and reduces the load on the pumps. Finally, inside the house we have a reverse osmosis filter that supplies water to the refrigerator icemaker and a tap next to the kitchen sink. It’s the best tasting water I’ve ever experienced, and it ought to be, considering how much I’ve invested in the system over the years. I learned many expensive lessons along the way. For example, stainless steel pumps don’t rust. The original pumps were cast iron. After a while we noticed that our water looked rusty. Yep, you guessed it... In came stainless steel pumps, and out went the rust, along with a considerable number of dollars. We now have a great system and no regrets – well, maybe a few, but too few to mention. I would do it all over again, but this time I’d get it right the first time. I emphasize here that you do not need to do what I’ve done unless your circumstances absolutely require it, and that would be rare. Most people may only need to have an inexpensive emergency backup system to filter water for drinking purposes. With the benefit of hindsight, I spent a lot of money that probably was not necessary, but I got an education along the way and I’m sharing that with you here. Learn from my mistakes and save yourself the expense. Here in parched Texas, I’m happy to have this system (which provides a 100 day supply with full tanks), but a similarly sized non-potable system would have been much less costly. As it happens, we have access to a community water system, so that could provide drinking water and the rainwater could supply our other needs. That brings me to water conservation. It’s a good idea to do a water audit of your home to see where you can save on water. For example, a front-loading washing machine uses less water than a top-loader. Turning the shower water off while you shampoo your hair saves water. Low-flow showerheads and water-saving toilets also conserve water. Much water is wasted needlessly. Water is becoming a precious commodity, and it should be treated accordingly. It’s not too much of a stretch to say that one day fresh, clean water may become the new gold. 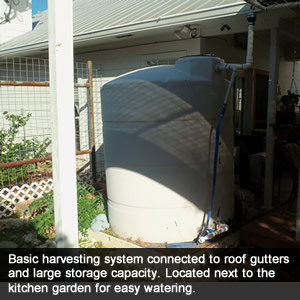 By the way, before you set about putting in a rainwater harvesting system, be sure to check and make sure you are not violating a local ordinance or state law. Believe it or not, there are laws in some places restricting your right to collect the rain that falls on your property. Until recently, in the State of Colorado it was illegal to harvest rainwater. That law has been repealed, as I understand it, and the trend elsewhere is similar. I’ve even heard of cases (though I have no specifics to share) in which local authorities require rainwater collection to be metered and a fee paid based on the number of gallons collected. From there it’s only a short step to charging people for the air they breathe. I suppose nothing much should surprise us these days. For those interested in rainwater harvesting, there is a formula for calculating the amount of water you can expect to collect based on the size of your roof. I won’t go into the details here, but if you are interested, please send me a private message with your contact information and I will send you the formula. Wherever you happen to live, I hope you will recognize clean water for the precious, scarce commodity it has become, and treat it with the respect it deserves. Water is just one of the many issues we must deal with as we prepare for whatever the future holds. I credit Chris Martenson’s Crash Course with helping me realize, three years ago, that I needed to make some common-sense preparations in case things start to get ugly. I’ve been an enrolled member since early 2009 and I reckon it has been a good investment. This “What Should I Do?” series draws upon specialized knowledge that members of the CM community have accumulated -- for some of us, the hard way -- and are happy to share with others. Good luck with your own preparations. There is a long history of harvesting rainwater for domestic use in Australia and about 20% of households currently do so. Metal roofs are one of the most common in Australia, so they are perfect for potable water collection, as long as they are not painted with lead paint. I grew up in a house in temperate Victoria which relied on rainwater collected in corrugated metal tanks for both drinking and all other household needs. At that time there was neither first flush diversion nor any filtration, and we never experienced any ill health from drinking it. As governments are now encouraging installation of tanks they are protecting themselves from litigation by recommending first flush diversion and filtration, despite the fact research has not demonstrated any correlation between drinking rainwater and illness (see 'Rainwater tank' on Wikipedia). After a decade of drought, many state and local governments in Australia provide rebates for installation of rainwater tanks connected to toilets and laundry to reduce pressure on public water supply dams. I currently have two rainwater tanks - 3,000 ltr tank on raised stand with a gravity fed tap and 12,000 ltr ground level with a pump ( I have a caravan pump I plan to install in this tank to access water in power outages). With rationed use this would be sufficient to meet our needs over an extended period. Thank you for sharing your experience on this subject. As a fellow Texan, last summer put things into perspective for me about this subject; I Need More Rainwater Harvesting and Storage Capacity! As the first step, I will be installing a new white metal "radiant cool roof" on the house in about a month, which should provide a much better surface to collect from. Do you have any experience with using ozone filters and UV sterilizers in the tanks? With the capacity of filtration that you have, do you really need all the tanks, or could an EDPM-lined pond/swimming hole work as a reservoir? Providing of course, that it was adequately protected from the sun and critters. Do you use any type of special gutter to provide some initial debris removal? 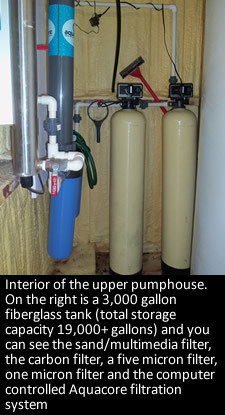 What kind of pressure tank do you recommend, and how much pressure loss does the filtration system impose at the faucet? An additional factor that I must consider is some kind of "stealth" irrigation of my garden and micro-orchard. During last summer, police cars travelled down my street multiple times a day looking for violations of the madatory water rationing ordinance. One of my neighbors got two $500 fines for watering his new landscaping. Where I lived in Mexico we had water, but the pump had failed. To save the pump, it was decided that they would only work the pump twice a day, once at morning and once at night, so working people could take their showers. For the rest of the day, everyone worked from their water storage. We had a concrete cistern on top of our house, which filled up when water was pumped, so we had water all the time. It was enough for the washing machine and everyday tasks. Of course rainwater is not a problem in the rainy growing season, and we had drought resistant plants in the yard anyway. For the eastern part of the U.S., we may have interrupted water service because of power issues, but I doubt water will be completely cut off to homes for long stretches of time. That said, it would be smart to have a system to supply the house if water was not being pumped for whatever reason. Hi, Jeff. Yes, my original (1997) rainwater harvesting system used an ultraviolet filter and it worked pretty well. But UV is not the optimum, nor is it the state-of-the-art in filtration systems today. My feeling is that you would get better value for dollars spent by going with another filtration system. I had more trouble with my UV filter than it seemed to be worth so when it needed yet another UV lamp I disconnected it and went with the Aquacore system. You might look into reverse osmosis filtration systems. They are very effective but like every other alternative RO has some limitations. It's a matter of picking the system or combination that meets your own needs. We have an RO setup under the kitchen sink, and it supplies the refrigerator icemaker and a little spigot atop the sink. It's overkill in our system but since we already had it we chose to leave it in place. Some people complain that RO filtered water has a sort of "dead" taste to it, but I've not noticed that at all. Funny you should mention ozone, for I am just starting to look into the possibility of adding one in my upper pumphouse. Based on what I've read so far, it seems to check out and I'll probably go ahead with it. Ask me about that in six months or so. You don't have to use tanks to store water. Most anything will do as long as you keep it reasonably clean and free of contaminants. I looked at all manner of storage systems, ranging from ferrocement to concrete cisterns. Finally I settled on fiberglass storage tanks. But more recently when we added the barn rainwater harvesting system, I checked on the price of fiberglass tanks and about slid off my chair onto the floor. My, but they are proud of those things these days. So we went with plastic tanks and they are entirely satisfactory in all respects. Ours are placed under the eave of the barn and out of the weather, but black plastic tanks can handle exposure to the weather -- and they are a lot cheaper. I paid about $1,200 each for five 3,000 gallon black plastic tanks, and that included delivery. Ha ha, "delivery" consisted of a guy with a flatbed trailer. He removed the straps, rolled the tanks off next to the barn and said, "Good luck; I'm outa here". It was, um, challenging to get them set upright, but we figured it out after an appropriate amount of muttering under our breath. On guttering, the best approach seems to be covering the gutters with wire mesh sufficiently small to keep out the leaves and twigs. That works. On the pressure tanks, we use metal tanks with expandable bladders inside. The electric pumps build up the pressure to a set level and cut off. Thereafter the pump does not need to run until the pressure bleeds down to a pre-set level. Most any kind of quality pressure tank will do the job and these are readily available from plumbing supply places. We have about 55 psi of pressure inside the house, which is more than adequate. We do not use our filtered water for outside watering so I can't answer your question about water pressure at outdoor faucets. When the drought hit, I invested in a 500 gallon farm "nurse" tank with firefighting pumps/hoses and I can use that to transfer water from the barn tanks and water my plants when water rationing is imposed. This worked pretty well last summer. If you see dollar signs flying, Jeff, you would be right about that. But we were desperate. You live in Texas too, so you know. Suggestion: Consider putting in a gravity flow drip irrigation system to water your vegetable garden and essential plants using rainwater collected from your roof. It's not difficult, it's inexpensive and it works. Furthermore, it's very economical with water use. Methinks you all worry way too much about your water contamination.... We've been on tank water here for over seven years now, with no problems whatsoever. We didn't even filter at all for the first three years, when she who must be obeyed determined the water started tasting "funny", so I installed a pair of filters I used to use in my darkroom, under the kitchen sink. The first (inline) is a Polypropylene Sediment Cartridge rated at 0.5 micron to pick up the rocks. The second is an Activated Carbon unit rated at 1 micron whose sole purpose really is to dredge the Giardia and Crypto devils. 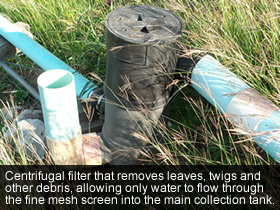 Put a crude filter on your inlet and outlet for your water tank, including the overflow. Use fly screen mesh that you would cover your windows. This will reduce the chance of bugs and birds getting into your water supply and dying. The one large problem I have had is a jacaranda tree that dropped it's flowers into the gutter. The flowers degraded and poisoned the water supply. I lost 35000 litres (9000 gallons). Put gutter guard or leaf guard systems on your roof. Some (not all) flowers and leaves will break down into poison. Cherry leaves break down into cyanide from memory. To live your life like water is not a problem make sure your water tank is large enough. I know people who have 30000 gallon (120000 litre) tanks and they don't worry about water. My tank is too small. If you want mains pressure install a header tank 20m above your house. Gravity will make it seem like you are still on town water. The pvc pipes you seem to be using leach lead. Use Galvanised iron or something else other than white PVC pipes. The leading cause of lead posioning in the western world is white pvc pipes. That is from the World Health Organisation. I have been asked for the formula to calculate the roof size and the amount of rainwater that can be collected. For any who might be interested, here is the math. By the way, I appreciate the comments so far, all of which have been constructive. What works for readers in Australia or New Zealand does not necessary work well here. For example, for a short time when we first installed our tanks and started to collect rainwater, we ran it directly into the house, unfiltered. One word: Ugh. If unfiltered works for you, great. Figure the number of square feet of roof: Multiply the length of your roof by the width to determine the number of square feet. For example, a 40’ X 50’ roof has 2,000 square feet. Find the number of gallons of rain per square foot of roof, measured to a depth of one inch: Hint: that’s .623. Keep in mind that this is the maximum, which is an ideal. Adjust downward to allow for system inefficiencies (see below). If you are on the Metric system, you’ll need to do some converting. Adjustments for inefficiencies: Adjust for the type of roof you have. An unpainted metal roof is probably best (especially if you want drinkable water), followed by tile. You can assume it is about 95% efficient. Next come concrete or asphalt roofs, which are also about 95% efficient. A gravel roof is about 70% runoff efficient, while a bare soil roof (anyone have one of these?) is about 75% efficient if you don’t mind drinking muddy water. Finally, a grass or sod roof is only about 17% runoff efficient. To adjust the above formula for your type of roof, multiply the answer above by the efficiency factor. For example, assuming a metal roof, multiply 41,990 gallons by .95 and you come up with 39,891 gallons. Family water usage: I’ve seen estimates ranging up to 260 gallons a day used by a typical family of four. My wife and I use much less water. We chose a front-loading washing machine, for example, that is much more water efficient than a top-loader. Estimate your daily and monthly water usage and plan your water storage needs accordingly. Include a margin for dry conditions that could last for several months. 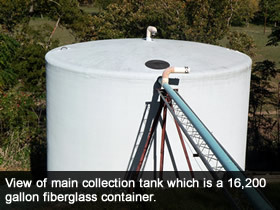 Storage tanks: Fiberglass tanks are light in weight for their size and last a long time, but are expensive. Plastic tanks are more affordable and hold up well. If you will be storing potable water (i.e., drinking water), your tank should be rated for that. Concrete cisterns are a good alternative and some have been in use for hundreds of years. You could even consider a portable swimming pool to store rainwater, as long as you don’t plan to drink it. Wood tanks are another option, and they can look good. Metal tanks are yet another alternative. Then there is ferrocement, which is a steel and mortar composite. Of course, stone or brick masonry tanks are yet another option. For a simple system, metal or plastic barrels are fine. Finally, for the handyman types, there is a solution pioneered in New Mexico, USA – the plastered tire cistern. It’s a circle of buried tires, inside of which is placed a wire mesh and the mesh is covered with plaster. Water is heavy. Five hundred gallons weighs a lot, so plan accordingly and carefully. If you set a storage tank on a dirt foundation, don’t be surprised if it starts to lean! Water weighs about 8 pounds per gallon. To inhibit algae growth, storage tanks should be opaque and as dark as possible. Make sure your storage tanks or barrels were not previously used to store farm chemicals or other toxic materials. Be sure you cover your storage tanks with fine mesh or a lid to keep out mosquitoes. You’ll need an overflow valve or outlet on your storage tank. Be careful where the water flows. You don’t want it undermining your storage tank’s foundation – or your house foundation. Hmmmm.... puzzling, but then again I've often wondered what was in the water in America......! All done in my head without a calculator. Plastic tanks are becoming very popular in Australia, but I much prefer the more traditional Australian steel tank. BHP make Aquaplate tanks for drinking water which is a food grade coating that doesn't taint water and stops the tank corroding from the inside. They come with a 20 year warranty. Water is collected in the 6000 gallon tank at L of the pic, and pumped up to the header tank with a barely visible demand pump I picked up new for $90! The water is exclusively used for the garden, and is another example of energy efficiency at work. The pump uses ~500W and only needs to run for 30 minutes to fill the tank (at a cost of 0.5 kWh). I can then water our 200m2 garden for a week without using any power by using gravity... Unless it's very dry (and hot like now) in which case I might have to do this twice a week. The entire project cost me under $3000 including the brand new header tank. We have the opposite problem -- too much water, it never stops raining. We are by a river so we have infinite groundwater for irrigation. In fact on the next river over there is a water bottling plant because the water is of such high quality. But our issue is that our river is rapidly taking out the bank and we need to do something to fix it fast, which becomes a headache with fisheries because salmon like to hang out under the bank. But it may soon jump around a big cedar tree and take out the well. This will not be cheap. It would also be good to have some capacity to pump water when the power goes out since it does fairly frequently with winter storms. "The system is based on an industrial 275 gallon container, known as an IBC. You can buy them used, or if you really look around, you can even find them for free. One problem with typical rain-barrels is that they can only collect 55 gallons. 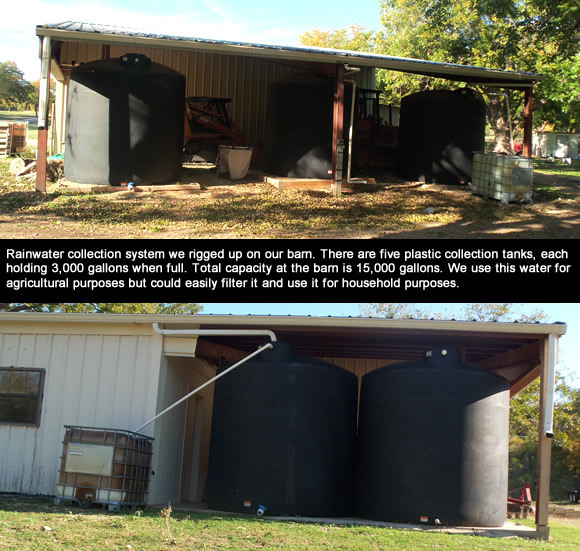 This rain storage container collects FIVE times that volume, while not taking up all that much more space than a single rain-barrel. After washing the container out well, it is ready to be repurposed for rainwater collection. I really like the irony of using GMO corn syrup containers to recycle into a conservation project!" Thanks for the tips! I’ve just started using a water tank, so now I just need to know how to maintain it properly. RO was mentioned as a treatment alternative, but remember that it wastes more water than it uses.